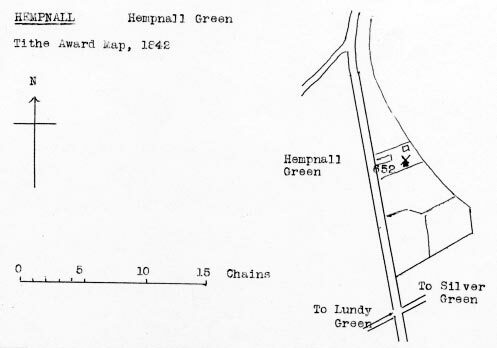 Hempnall Green smockmill was an eight sided mill that used patent sails to drive two pairs of stones and a flour mill. A Bake Office was also run from the premises. At Hempnall, the top of the newly-erected mill on the green with its four sails was blown off. All that capital SMOCK WIND MILL (recently erected) with two pair of Stones & Flour Mill complete & the going gears & machinery thereto belonging, situate in Hempnall in the county of Norfolk, with new built brick & tiled Dwelling house, Baking office & about half an acre of Land, with a Stable & other Outbuildings standing thereon. 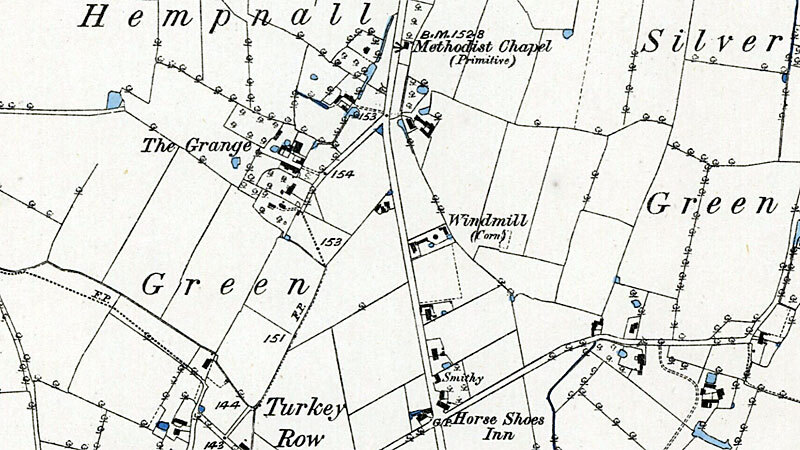 All which premises are in the occupation of the proprietor Mr. William Spurdens. Apply (if by letter free of postage) to Mr. W. D. Barker, Solr., St. Michael at Plea, Norwich. a SMOCK-TOWER MILL with Patent Sails, driving two pair of stones, Flour Mill etc. with a detached pair of stones & machinery adapted to a Moveable Engine, all in good working condition. Dwelling house, Granary, Stabling etc. & with or without 2 Acres of Land. For particualars apply to Mr. Richard Hylton, Hempnall, Long Stratton. Two miller's carts, Mare, Harness, 5 flour cloths, 61 lb. Mill Bills, new Flour Beam & Scales, Iron Weights, Household furniture etc. Clowes, Tewson & Nash are instructed by Mr. S. Culley, the Assignee to Sell by Auction on the Premises on Friday next 27 June at One, the above, the Effects of Mr. Edward Eldred, Miller. Catalogues of the Auctioneers, Bungay & Bank Chambers, Norwich. I can faintly remember the one on the Greens, near "The Horseshoes".